I think we can all agree that pill popping isn't the best way to ensure healthy kids. 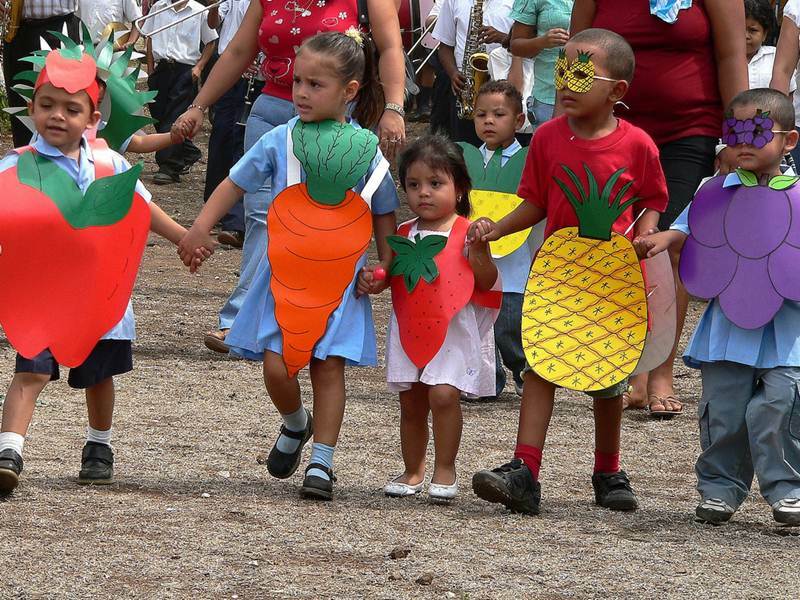 Real kids need real food and balanced meals that provide healthy nutrients. Still, some kids, including vegetarians, vegans and picky eaters may benefit from a daily vitamin. However, many popular vitamins for kids come in a slew of rainbow colors that are fake and icky, such as Red #40, Yellow #6 and Blue #2, plus have artificial flavors and sugar. That's not a healthy supplement. If you're looking for a smarter option, keep reading to check out our top picks for natural vitamins for kids. 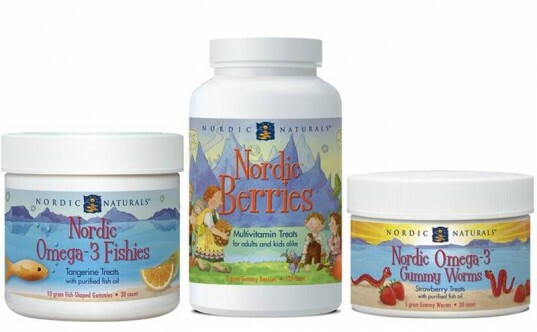 NOTE: Remember, the best source of advice regarding healthy natural vitamins for kids is your own pediatrician. Rainbow Light NutriStars offers a complete nutritional system for your child that’s packed with essential nutrients, nourishing vegetables and green foods, targeted herbs, and antioxidants to support your child’s growing mind and body. Each tasty vitamin is gentle on the stomach and 100% natural and free of artificial colors, flavors, sweeteners, preservatives and additives. 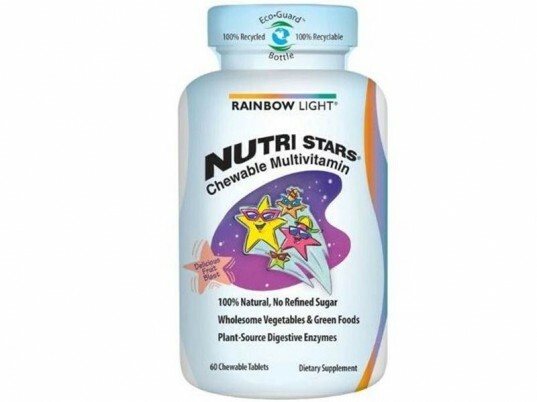 NutriStars Chewable Multivitamins are also lactose-free, dairy-free and yeast-free. Each vitamin contains the equivalent to 92 mg of vegetable powder, nutrient-rich foods such as carrots, spinach and broccoli, which are blended together for optimal nutritional support – great for picky eaters! All the best essential vitamins and minerals are specifically included including, 120 mg vitamin C (200% DV) and an energizing vitamin B complex including 3 mg vitamin B-1 (200% DV), 3.4 mg vitamin B-2 (200% DV) and 4 mg vitamin B-6 (200% DV). NutriStars® also provides potent antioxidant protection with 30 IU of vitamin E (100% DV), vitamin C and vitamin D3. The vitamins come packaged in 100% post-consumer recycled, 100% recyclable eco·guard® packaging. These little berries pack a powerful nutritional punch including 100% of the daily value of the most essential nutrients— such as zinc and vitamins A, B, C, D3, and E. These are easy to chew, pectin-based, and contain zero artificial coloring, flavorings, or preservatives and are totally gelatin and allergen free. The vitamins are flavored with a sweet-and-sour citrus taste of “cloudberries.” This company also offers Children’s Omegas and Children’s Gummies. The major downside of these vitamin packs is the excess packaging. However, if your little one has trouble with pills of any kind – either chewing or swallowing then these handy vitamin formulations are a dream come true. 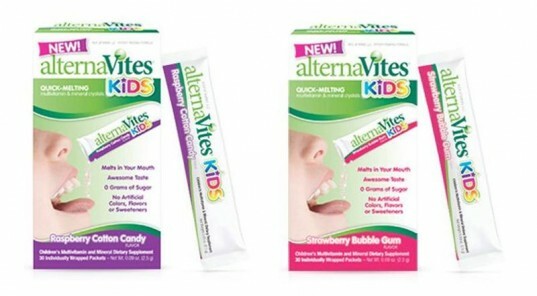 alternaVites Kids® contains 17 essential vitamins and minerals specially formulated for children ages 4 and up. The little vitamin packs pour onto the tongue and melt away easily. Each packet contains zero grams of sugar, zero aspartame, zero high fructose corn syrup and no artificial sweeteners, colors, flavors or preservatives. Vitamin packs are animal product free and don’t contain egg, milk, peanut, tree nuts, wheat, soy, fish or shellfish, plus they’re certified kosher. If extra picky kids won’t take these on their tongue, you can mix it into yogurts, puddings or smoothies, sprinkle it on top of fruit or lick it off a spoon. There are two awesome flavors to choose from – strawberry bubblegum and raspberry cotton candy. 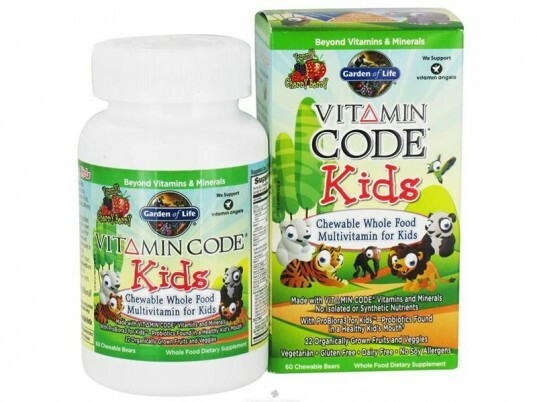 Vitamin Code® Kids are yummy, cherry-berry chewable multivitamins specifically designed to meet the unique nutritional needs of kids. These vitamins contains ProBiora3 for Kids™, probiotics found in a healthy kid’s mouth along with 22 organically grown fruits and veggies and provides immune support, eye health, health for growing bones, digestive support and mental and physical energy. These vitamins are vegetarian and gluten-free. The “Code Factors™” means they’re infused with essential elements from whole food with zero yucky chemical isolates or synthetic nutrients and the fruits and veggies in these are organically grown. Gummi King™ Multivitamin & Mineral, Vegetables, Fruits & Fiber gummies are made in the USA and come in six natural fruit flavors (strawberry, lemon, orange, grape, cherry & grapefruit). They are vegan and gelatin free and provide kids with essential enzymes and anti-oxidants that contribute to healthy bodies. They’re also a great source of potassium. All kids gummies are cruelty free and certified vegan and manufactured in an allergen free room and contain no yeast, wheat, milk, eggs, soy, gluten, salt, peanuts, tree nuts, shellfish, artificial colors, artificial flavors, salicylates, or preservatives. Also vitamins are made of 100% natural colors and flavors and are lead free. 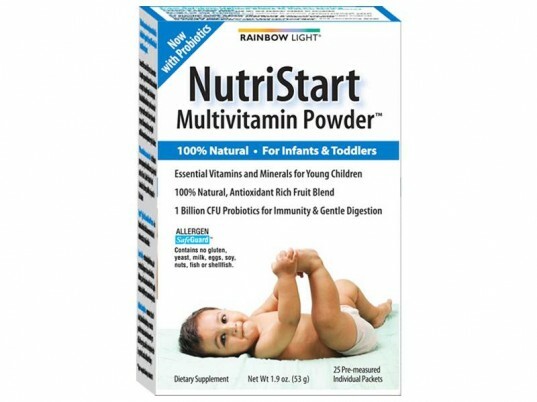 If your baby is in need of extra nutrition, then Rainbow Light NutriStart provides the optimum balance of nutrients and nourishing foods such as blueberries, apples, vitamin C, vitamin D3 and choline, that helps support optimal growth and development for children 6 months to 4 years of age. Each easy to use individual serving packet is pre-measured, 100% natural, easy to digest and Allergen Safeguard® guaranteed to contain no gluten, yeast, milk, eggs, soy, nuts, fish or shellfish. There are no artificial colors, flavors, sweeteners, preservatives or additives added. The 25 mg Fruit Blend contains organic apple, banana, elderberry and blueberry to deliver nutrient-rich antioxidants that are gentle on the stomach and tasty. Hi Daleena- please visit the websites of the vitamins we listed for more information and purchasing info. Rainbow Light NutriStars offers a complete nutritional system for your child that's packed with essential nutrients, nourishing vegetables and green foods, targeted herbs, and antioxidants to support your child's growing mind and body. Each tasty vitamin is gentle on the stomach and 100% natural and free of artificial colors, flavors, sweeteners, preservatives and additives. NutriStars Chewable Multivitamins are also lactose-free, dairy-free and yeast-free. Each vitamin contains the equivalent to 92 mg of vegetable powder, nutrient-rich foods such as carrots, spinach and broccoli, which are blended together for optimal nutritional support – great for picky eaters! All the best essential vitamins and minerals are specifically included including, 120 mg vitamin C (200% DV) and an energizing vitamin B complex including 3 mg vitamin B-1 (200% DV), 3.4 mg vitamin B-2 (200% DV) and 4 mg vitamin B-6 (200% DV). NutriStars® also provides potent antioxidant protection with 30 IU of vitamin E (100% DV), vitamin C and vitamin D3. The vitamins come packaged in 100% post-consumer recycled, 100% recyclable eco·guard® packaging. These little berries pack a powerful nutritional punch including 100% of the daily value of the most essential nutrients— such as zinc and vitamins A, B, C, D3, and E. These are easy to chew, pectin-based, and contain zero artificial coloring, flavorings, or preservatives and are totally gelatin and allergen free. The vitamins are flavored with a sweet-and-sour citrus taste of "cloudberries." This company also offers Children’s Omegas and Children’s Gummies. The major downside of these vitamin packs is the excess packaging. However, if your little one has trouble with pills of any kind - either chewing or swallowing then these handy vitamin formulations are a dream come true. alternaVites Kids® contains 17 essential vitamins and minerals specially formulated for children ages 4 and up. The little vitamin packs pour onto the tongue and melt away easily. Each packet contains zero grams of sugar, zero aspartame, zero high fructose corn syrup and no artificial sweeteners, colors, flavors or preservatives. Vitamin packs are animal product free and don't contain egg, milk, peanut, tree nuts, wheat, soy, fish or shellfish, plus they're certified kosher. If extra picky kids won't take these on their tongue, you can mix it into yogurts, puddings or smoothies, sprinkle it on top of fruit or lick it off a spoon. There are two awesome flavors to choose from - strawberry bubblegum & raspberry cotton candy. Vitamin Code® Kids are yummy, cherry-berry chewable multivitamins specifically designed to meet the unique nutritional needs of kids. These vitamins contains ProBiora3 for Kids™, probiotics found in a healthy kid’s mouth along with 22 organically grown fruits and veggies and provides immune support, eye health, health for growing bones, digestive support and mental and physical energy. These vitamins are vegetarian and gluten-free. The "Code Factors™" means they're infused with essential elements from whole food with zero yucky chemical isolates or synthetic nutrients and the fruits and veggies in these are organically grown. Gummi King™ Multivitamin & Mineral, Vegetables, Fruits & Fiber gummies are made in the USA and come in six natural fruit flavors (strawberry, lemon, orange, grape, cherry & grapefruit). They are vegan and gelatin free and provide kids with essential enzymes and anti-oxidants that contribute to healthy bodies. They're also a great source of potassium. All kids gummies are cruelty free and certified vegan and manufactured in an allergen free room and contain no yeast, wheat, milk, eggs, soy, gluten, salt, peanuts, tree nuts, shellfish, artificial colors, artificial flavors, salicylates, or preservatives. Also vitamins are made of 100% natural colors and flavors and are lead free.